Almotamar.net - A memorandum of understanding between NATCO Company, one of Hayel Saeed Anam Group and the Malaysian National Company for Electricity (Tenaga) has been signed in the Malaysian capital Kuala Lumpur on Wednesday for investment in electric power in Yemen. The NATCO was represented by the Regional Manager of Pacific Interlink Co. of Hayel Saeed Group in Malaysia and for the Malaysian side represented by the Executive Chairman of the Tenaga Nasional Berhad for Electricity (TNB). 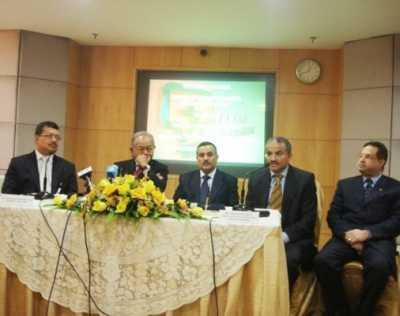 The signing ceremony was attended by the Yemeni ambassador to Malaysia and the Malaysian ambassador to Yemen in addition to Chairman of Tenaga Company. The regional manager of Pacific Interlink has affirmed keenness of NATCO Company on benefiting from the Malaysian experience in power generation and the intention of transferring it to Yemen through entering investment partnership projects for the development of electric power system in Yemen due to Yemen’s present suffering from shortage in power generation. He added that the agreement came as a result of a visit of Tenaga company delegation to Yemen on 9 November 2010 to explore opportunities for investment in the area of power with the Yemeni private sector. For his part, the Chairman of Tenaga Company welcomed the expansion of his company’s investments to Yemen due to the many attractive investment opportunities in power generation field. He added that signing the memorandum of understanding with NATCO exceeds the agreement between the two companies to become partnership relation between Yemen and Malaysia. He has also praised the reputation of the Group of Hayel Saeed Anam at the local and international levels and that would be reflected on developing the relation of partnership with Tenaga Company to broader horizons.